Just about every restaurant you go to has their own version of mozzarella sticks on the menu, some better than others. But have you ever thought of making homemade mozzarella sticks? I couldn’t think of an easy way to do it until I found out that you could use string cheese! Since Pete is in love with string cheese, we always have it in the fridge. So one night when I needed a quick appetizer to make I created this delicious recipe for homemade mozzarella sticks, plus they are baked instead of fried! Just be sure to watch these in the oven closely. They will melt into a puddle in a heartbeat. Cut string cheese in half and place in freezer for at least an hour. This plus using low fat string cheese will keep them from melting into puddles as easily. Preheat oven to 375 degrees F. Spray baking sheet with nonstick cooking spray. Dip string cheese into egg mixture and let excess drip off. Immediately dip into breadcrumbs and place on greased baking sheet. Repeat process for all string cheese. 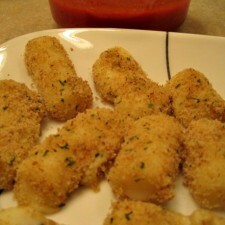 Lightly spray all mozza sticks with a coating of nonstick spray. Bake for 5-10 minutes. Watch these like a hawk! They melt into puddles very easily and although they will still be delicious they just won’t be in stick form. Make sure to catch them right at the point where the cheese is melted, the breadcrumbs are slightly browned, and they will turn into puddles any second. Serve immediately with marinara sauce. Enjoy! I always love cheese stick. However, we usually fry it rather than baking. I have to try your version soon.